Becoming a Naval Flight Officer is a long journey that requires college, officer training, medical, physical and academic approval, and flight training that is competitive from the start so your abilities need to be above average in order to be successful. The following is an overview of the job descriptions and qualification factors for Navy commissioned officer job designations. Learn about working in Naval Aviation as a Naval Flight Officer (NFOC). At least 19 and less than 30 at time of commission. Waiver up to 24 months for prior AD service. Though not many people have a 4 year college degree at 19 years old. No restrictions, but technical degrees preferred. Correctable to 20/20 (waivers NOT considered). Phorias: No obvious Heterotropia or Symptomatic Heterophoria. Refraction: < ±6.00 sphere; < -3.00 cylinder. PRK only eye surgery waivable. LASIK not waivable for aviation. PRK and LASIK not waivable for any community if pre-surgery refraction exceeds specifications shown above. 6 yrs Active Duty from date of designation as NFO. Must be within anthropometric limits. No waivers. Applications will only be considered if available for OCS within 18 months unless applying for BDCP. Should be able to swim prior to OCS. Flight pay during training = $125/mo. Finally, weight limits prohibit any training for applicants over 235 lbs. This is due to the safety concerns of ejection seats. No candidate will be allowed to enter training who is over 235 lbs. Naval Flight Officers (NFOs) are members of the select, highly skilled Naval Aviation team. NFOs may be radar intercept officers, tactical coordinators or airborne electronic warfare specialists. The Navy maintains and operates more than 4,000 aircraft including carrier-based jets, land-based patrol and reconnaissance aircraft, transport planes and sea and land-based helicopters. 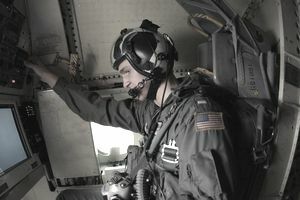 The Navy offers the world's most advanced and extensive training for candidates who qualify as skilled aviation professionals in a high-quality organization. Civilians transition to aviation officers during 13 weeks of intensive academic and military training at Officer Candidate School (OCS), Naval Air Station (NAS) Pensacola, Fla. NAS Pensacola is famed as the birthplace of Naval Aviation. Established in 1914, it is often called the "Annapolis of the Air." Aviation training is conducted at the Naval Aviation Schools Command (NASC) at Pensacola. OCS is challenging, requiring hard work and long days to build confidence and pride. Upon successful completion of preliminary training at OCS, future Navy pilots, NFOs, and AMDOs are commissioned as Ensigns. All Ensigns entering aviation programs will then complete a six-week air indoctrination course at NASC, Pensacola. Specific job elements for a first tour. Naval Aviation is renowned for the demands it places upon its flyers. The skills and concentration required to land a high-performance jet onboard an aircraft carrier deck pitching in the black of night, or to track a submarine while flying at only a few hundred feet above stormy seas, are not just linked to a solid academic background and top physical conditioning. There is more to it than that; it requires a combination of talents and dedication that many people possess, but few are challenged to use to full measure. Active duty obligation. Candidates will serve a minimum of six years on active duty from the date of designation as a Naval Flight Officer. Candidates who do not complete the Naval Flight Officer program will serve four years from the date they are disenrolled from flight status unless released by the Deputy Chief of Naval Operations (Manpower, personnel, and training). Training Pipeline following commission. Naval Flight Officer. As a student Naval Flight Officer, you'll get specialty training on the most advanced tactical systems and complex communications systems found in all Navy aircraft. You'll study aerodynamics, aircraft engine systems, meteorology, navigation, flight planning and aircraft safety. Next, you'll train in a specialized area of naval aviation for a specific aircraft. Strike Fighter. Carrier-based F/A 18D/F Hornet strike fighter, and F-14 Tomcat strike-fighter. Advanced Radar Navigation and Airborne Early Warning system. Carrier-based E-2 Hawkeye early warning and control aircraft. Advanced Navigation. EP-3E and P-3 Orion patrol and reconnaissance aircraft or E6 strategic communications aircraft. In any of these aircraft, you are the key to successful mission accomplishment. You'll immediately analyze all the information collected and direct the action against enemy submarines, surface ships or aircraft. You'll receive your "Wings of Gold" when you complete your specialized training, earning your designation as Naval Flight Officer. You'll report to a Fleet Replacement Squadron (FRS) for training in your specific aircraft and then report to your first operational squadron. In your squadron, you'll join new and experienced Naval Flight Officers and pilots. You'll work together to hone your skills, becoming part of the highly trained, professional team that is our nation's first line of defense. Locations of initial fleet assignments. Initial experience assignments are normally to aircraft including carrier-based jets and multi-engine turbo-props, land-based patrol and reconnaissance aircraft, as well as strategic and transport planes. Special pay/bonuses. Naval aviation officers receive aviation career incentive pay in addition to their regular salary. Student aviation officers receive $125 per month flight pay during flight training. The monthly amount of flight pay received depends on time in service and increases by hundreds of dollars within a few years to the current maximum of $840.00 per month. In addition, you may be eligible for retention bonuses at the end of your initial commitment, currently worth up to $195,000 over a 25-year career. Basic eligibility requirements. Applicants must be citizens of the United States. Applicants must be at least 19 years old and not have passed their 30th birthday on commissioning. Maximum age limit may be adjusted upward to their 32nd birthday on a month for month basis for active duty and prior military service applicants. Applicants must have a Bachelor of Arts or Bachelor of Science degree from an accredited College or University. Must have a cumulative grade point average of at least 2.0 on a 4.0 scale. Major: No restrictions, but degrees in technical disciplines preferred. Mental: AQR 3/PFAR 4/ PBI 3. The Commander, Navy Recruiting Command (CNRC) will endeavor to select candidates with the highest mental qualifications, accepting minimum scores only when market conditions or exceptional cases warrant. Physical: Must be physically qualified and Aeronautically adapted in accordance with the physical standards established by the Chief, Bureau of Medicine and Surgery (CHBUMED). Active duty military members accepted as candidates must obtain an aviation physical exam from a qualified Flight Surgeon to determine aeronautical adaptability.